I don't know if this is a tip which was previously posted and has fallen off the cache or whatever but I guess it's one you either know and use all the time or one you'll be glad someone pointed out to you if you've never heard it before. Anyway, I'm sorry if I'm repeating old news but there are various combo keys for screen grabbing and they are all really handy.. If you want to simply capture the whole screen to a file on your desktop hold down Shift + Apple + 3. If you only want a selected portion of the screen use Shift + Apple + 4. This will invoke a marquee selection box which you use to define the area you want to capture. Holding down Shift + Apple + 3 + CTRL sends the whole screen to the clipboard and similarly 4 sends only the selected area to the clipboard. This is a massively useful thing to be able to do if you want to simply Paste your screen into a Photoshop document without having to fluff around creating files you're only going to delete as soon as you've opened them anyway. The default file sent to the desktop using the first two methods in Panther is a PDF. In Tiger it's a PNG. 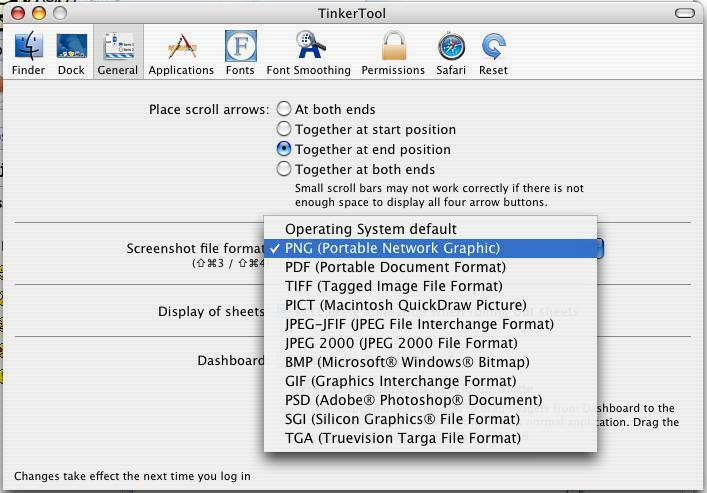 Using the freeware tool TinkerTool http://www.bresink.com/osx/TinkerTool.html you can change the default screen grab file type (thereby negating the need to launch Grab.app just to take screen shot and save it in a different format). 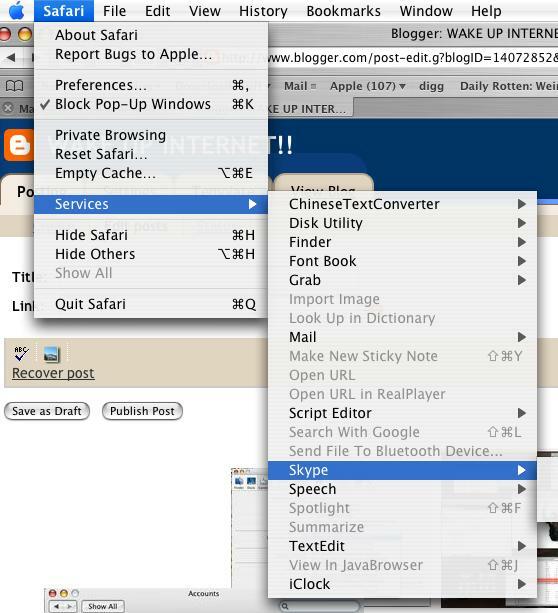 TinkerTool also allows you to mess with lots of other cool hidden features of Mac OS X. 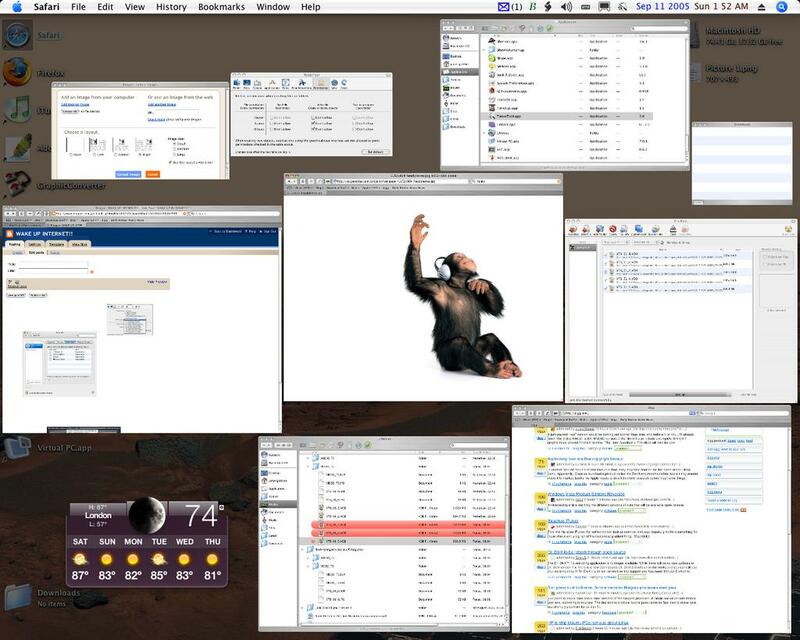 Such as enabling debugger modes in various apps, such as Dashboard, which allows you to snap Widgets off into the normal desktop space (see first image above with floating Weather Widget) and speed up pop down window animation times.